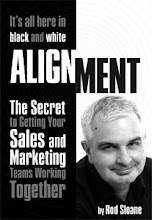 Sales and Marketing Alignment Blog from Rod Sloane: Can you See the Real Me? Track 2, Side One of the Who's Quadrophenia is one the boys best performances, the song is “The Real Me”. It has one of the best bass lines in rock music. Love it. Now part of my goal with this blog is for you to see me, the real Roderick P. Sloane. I want you to see the real me, because.... I want you to see how I'm different. Dramatically Different! Obviously, you can only get a flavour of what I'm like from my words, important even though they are. So if you can see and hear me, then maybe you get an impression of how I'm different. One way I choose to do this is with AudioBoo which is an iPhone application. It allows you to make a quick recording on your iPhone and then upload to your profile on AudioBoo. All happens very quickly. It's like an audio version of twitter, maybe! You can listen to my AudioBoo profile here.